ALPSP blog: at the heart of scholarly publishing: Open Access: what does the librarian or customer community need and how do we install new plumbing? Open Access: what does the librarian or customer community need and how do we install new plumbing? John Norman is Director for the Centre for Applied Research in Educational Technologies at the University of Cambridge. He kicked off the afternoon sessions at The Mechanics and Reality of Open Access seminar. At Cambridge, they conducted research into getting published. The experience doesn't split STEM/Humanities so much as single researcher (author) versus team research (multiple authors). Positive emotional states are associated with publication and impact. Negative emotional states are associated with making publishing decision, rejection and using publisher system. Researchers are the ultimate customers. What do they need? Access to all important research relevant to their field. They don't always get it. What they want is access to be timely and convenient. And they want the same for the production of their articles. When RCUK policy came into force, they took a service model of 'tell us about your article and we'll tell you what options are available.' They tried to keep it simple as it is so complex so they could take the burden of complexity off the author. It has proved to be a very popular approach. The overall number of articles is c. 8,000 per annum. They have c. 500 publishers they deal with annually. From enquiries, they made 277 payments (invoices which they authorised). There were 72 articles submitted to the institutional repository. Interestingly, 40% of articles had some sort of publishing problem and 296 articles were available in a satisfactory form for RCUK at 4 April 2014. There were 364 APCs authorised; £724k committed; with an average APC c. £1800. Full data on Cambridge's APC payments is available on figshare). They find it most helpful to use a diagram of the publishing value chain to explain to authors (article submission; initial review by publisher / article rejected; peer review / article accepted, Copyright Transfer Agreement signed / Article rejected; publishing / typesetting / copyediting / article published; public review / withdrawal, modification, altmetrics.) There is no doubt in Norman's mind that the Version of Record is considered more important by authors. The complexity of understanding multiple funder information shouldn't be underestimated. They average around 30 minutes per enquiry for their team. One example is an article that acknowledges funding from BBSRC and the British Heart Foundation. 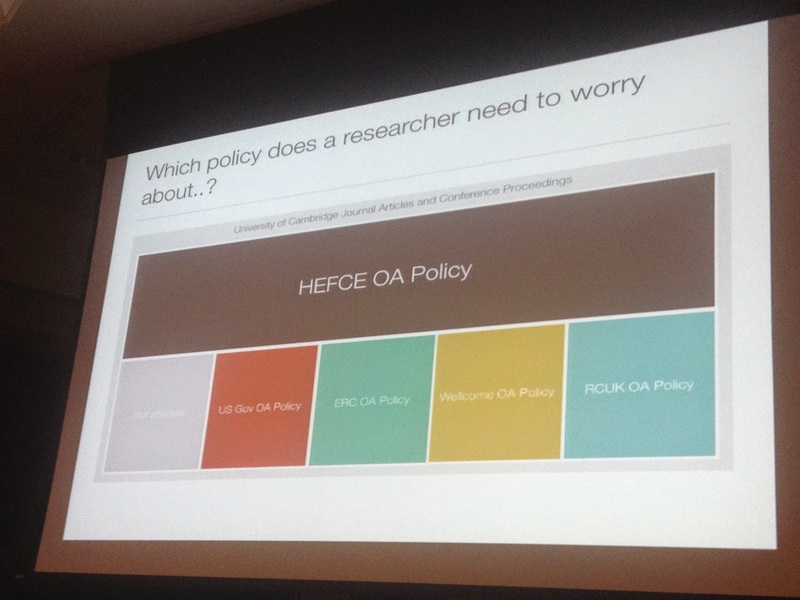 The relevant Open Access policies are HEFCE, BBSRC, BHF, publisher and institution. That's five different sets of mandates to comply with, some of which are contradictory. What would help? Simple, unambiguous, machine readable published information from publishers on key elements of an OA option. Version: are we talking about the publishers Version of Record or the Author Accepted Manuscript (and can we limit options to these two). Licence: can we make explicit the licence options that apply to the article and limit the range (CC useful for this)? Embargo: make explicit a single embargo in months from known publication date. Price: it may be free, but does the price exclude tax for each version/licence combination? Some simple things publishers can do to help libraries (John's wish list) are a notification to the institution that an author has had an article accepted. Provide a free print copy of accepted article version in PDF form on acceptance and a free print copy of accepted article version in PDF form with licence. Norman's final point was don't forget the reader. Creative Commons licences express permissions in a way the reader can easily understand. 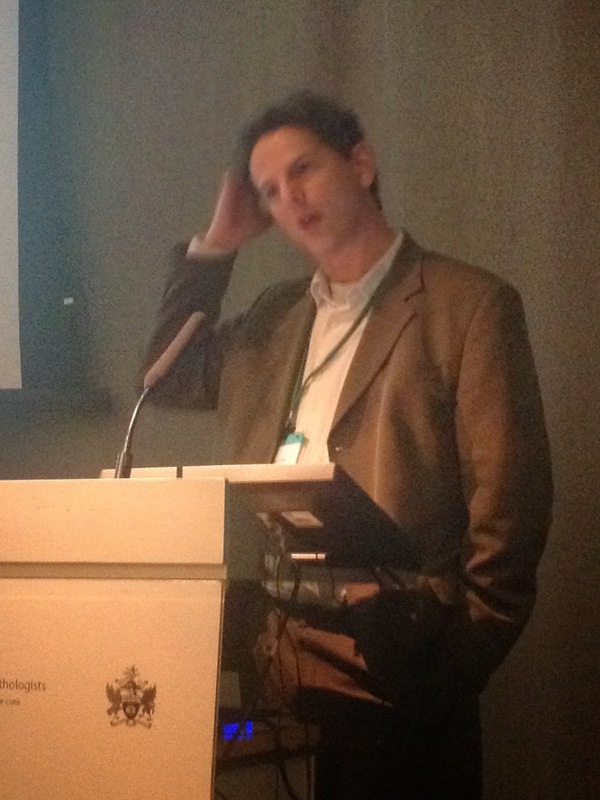 Neil Jacobs from Jisc talked about 're-plumbing' infrastructure. It needs to be more flexible and scaleable in a time when universities and funders have new roles. What do universities need to know? Questions such as how do I know if author papers have been submitted to journals? What authors have published? What have we paid for APCs? Have we complied with funder policies? What are our financial liabilities? 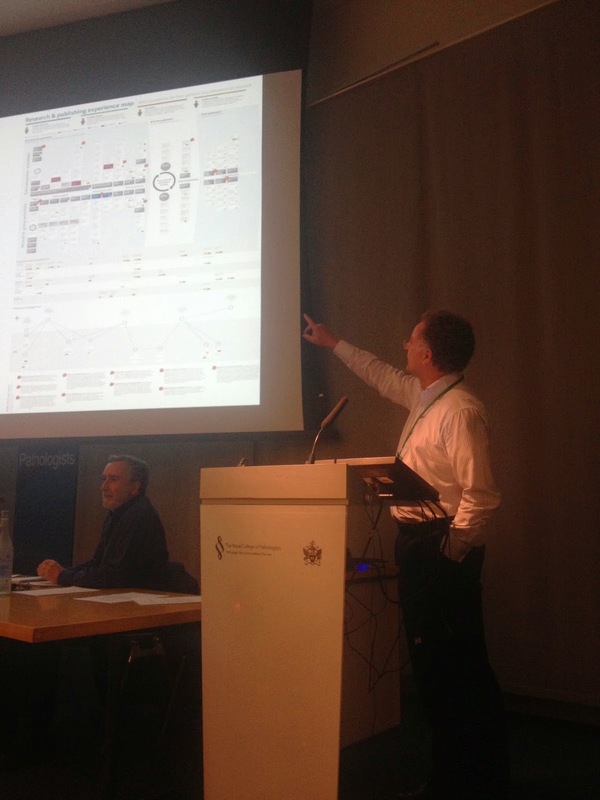 He reflected on the complexity in the publishing content cycle and metadata requirements. It is not sufficiently scaleable or accessible. If you take standards and identifiers, there are some clear gaps including Publisher and APC identifiers. Repositories - OpenDOAR, ISSN ROAD? Other emerging areas for standards and identifiers are research data and software. In the future, there will likely be a requirement for relationships such as attribution, contribution, affiliation and citation. Jacobs closed with a mention for the OA Implementation Group's guide to Gold for Open Access for Learned Societies.